Jimmy Garoppolo played just three games in 2018. When his torn knee ligaments ended his year in a game against the Kansas City Chiefs, the 49ers’ season essentially was buried, too. But Garoppolo reportedly has worked hard this offseason to rehabilitate his knee after surgery, and should be ready to participate fully by training camp this summer and perhaps in some spring drills. Niners head coach Kyle Shanahan recently told reporters Garoppolo is ahead of schedule. “He’s been healing great,” he said. 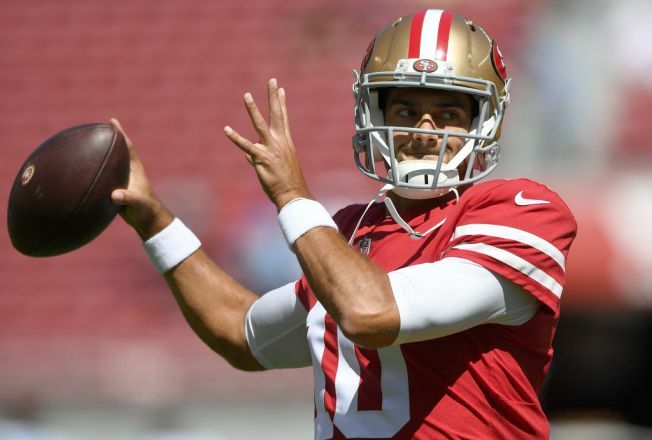 Though Garoppolo had a rough start to 2018 before the injury – going 1-2 and throwing three interceptions along with five touchdown passes – the 49ers still believe he’s the quarterback to lead the franchise back to being a playoff team and Super Bowl contender. With a better supporting cast, bolstered by some new free agents and draft picks, San Francisco could finally be positioned to make a move after records of 6-10 (2017) and 4-12 (2018). Former 49ers wide receiver Terrell Owens, now a Hall of Famer, has no doubt the 49ers have the right man for the job in Garoppolo. Though Garoppolo is 27 and has been in the NFL since 2014, he spent most of his career as Tom Brady’s backup in New England and has started just 10 NFL games. So, the sample size is small. But in those games he has an 8-2 record, has completed 65.4 percent of his throws and has 17 TD passes vs. eight interceptions and a 97.3 quarterback rating. Owens believes 2019 will be the season Garoppolo and the 49ers take off.